Considering making a move to an assisted living community can be frightening for both seniors and their family members. Many people often view assisted living as a last resort, but this is not the case. Assisted living is designed to help those who may not be able to provide all of the necessary care themselves, while still allowing them to maintain as much independence as possible. It is also an excellent pre-emptive measure against any problems before they may arise. 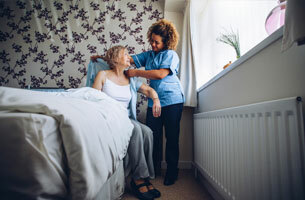 Often, people can live a more fulfilling and happy life when they move into a senior living facility when they’re at a stage that only requires some help, as opposed to living elsewhere and moving into a senior care center after an incident happens and they require a higher level of care. Here are some suggestions to make the transition easier for both those coming to live in the community and their family. Stay Positive – Staying positive and embracing the changes is essential. Your new living space is comfortable and has many services and amenities to help you enjoy a relaxed and maintenance-free lifestyle. Make Friends with the Other Residents – Take a look at the community activities calendar and see what events interest you. Don’t be afraid to participate in these activities! Most residents often find they have more fun socializing with others than they expected. They are also a great way to meet new people and interact with others who share similar interests. Creating new friendships is an excellent way to help get more comfortable in your new surroundings. Get to Know the Staff – The staff in the community is there to help you with whatever you need. Feel free to ask them any questions and discuss any problems until you feel comfortable and satisfied. Keep in Touch – Take time to visit when you can, or schedule a phone call every few days until your loved one settles in. Letting them know you’re still there for them will help give them comfort and peace of mind. Help Decorate the Space – While it is inevitable that your family member will be downsizing, help them make some choices when it comes to decorating and what to bring. Items like pictures, photos, and blankets can help make the new living space feel more familiar and comfortable. Don’t Feel Guilty – It’s normal to feel slightly guilty about having to move a family member into an assisted living community, but it’s for the best. Take time to realize how much better their quality of life will be with this move, and how much of their independence they will regain when they are in a safe environment that provides the support to allow them to do more of the things they want to do. At Wyndemere Woods, we provide nutritional meal choices to promote healthy living, and a fit lifestyle. We have regular games, crafts, activities, and programs to help seniors enjoy themselves and spend time with friends. With regular excursions and outdoor events, we provide many different options to help keep our residents engaged, active, and happy.